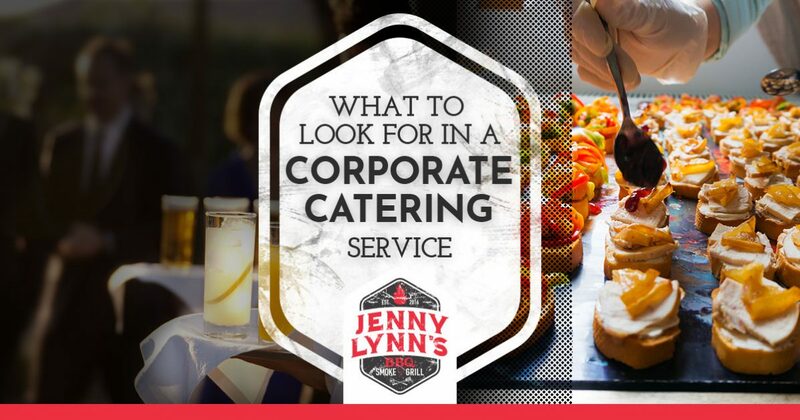 In a previous post, we explained why you should hire a corporate catering service. But what specific qualities separate one vendor from another? Take your event into account – Remember that not all caterers are the same. Unfortunately, a sizable chunk of event catering services stick to a “cookie-cutter” or “one-size-fits-all” approach. It’s imperative to weed out these businesses as early as possible during your search. The big thing here is to think about your event needs and size. For example, will your caterer be responsible for a five-course meal or just a few appetizers? The best catering services are usually the ones that are most flexible. 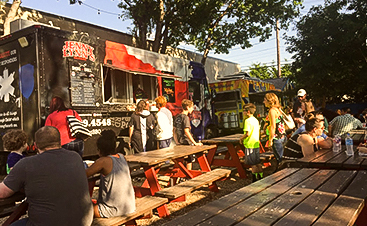 Location is important – Just like real estate, location is critical when it comes to finding the right caterer. Obviously, the majority will only travel within a certain radius. Is the caterer you choose willing to go the extra mile (literally) but has little experience with the venue? Then it might be in your best interest to search elsewhere. The last thing you want is for your event to be an absolute disaster because your caterer got lost. Look closely at reviews – It’s one thing for a catering service to promise you the moon. It’s another, though, for them to actually follow through on what’s stated in the contract. So how can you gauge a caterer’s quality of work? We recommend checking reviews. These shouldn’t be limited to word-of-mouth reviews, either. Take some time to scour online testimonials and be on the lookout for any comments that would cause you to look elsewhere. Be smart about cost – “You get what you pay for.” We’re willing to bet you’ve heard that countless times in your life. Well, it also applies to the catering industry. It might be tempting to settle for a catering service just because they offer the lowest prices of anyone in town. Remember the other factors, though. A corporate catering service that offers abnormally low prices probably doesn’t emphasize quality. There has to be some give and take here. While just about everyone adheres to a budget, it’s important to think about what you expect from your corporate catering business in return. Value the details – Plenty of catering companies skate by doing the bare minimum. It goes without saying that you want to hire a team willing to go above and beyond for your occasion. Have any questions before the big day? A detail-oriented caterer will be happy to answer them and even review the plan. Plus, it never hurts to work out the kinks so there are no surprises. Are you tired of sandwich after sandwich at work? We understand. 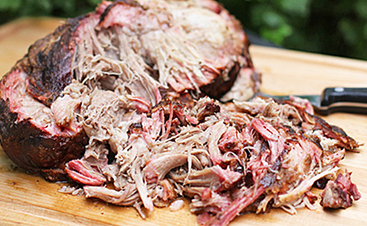 Jenny Lynn’s BBQ & Catering will ensure that your next lunch meeting is a hit. 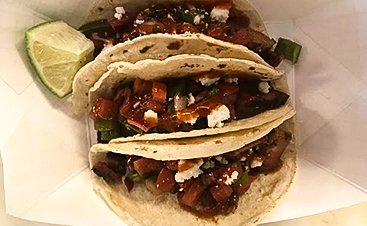 You can taste it now: the sliced brisket, the pulled pork tacos, the hand cut fries. Oh yeah, we should also mention that our pitmasters take 13-15 hours to smoke the most delicious meats you’ve ever tasted. Don’t just type ‘lunch catering near me’ into Google and call a random business. 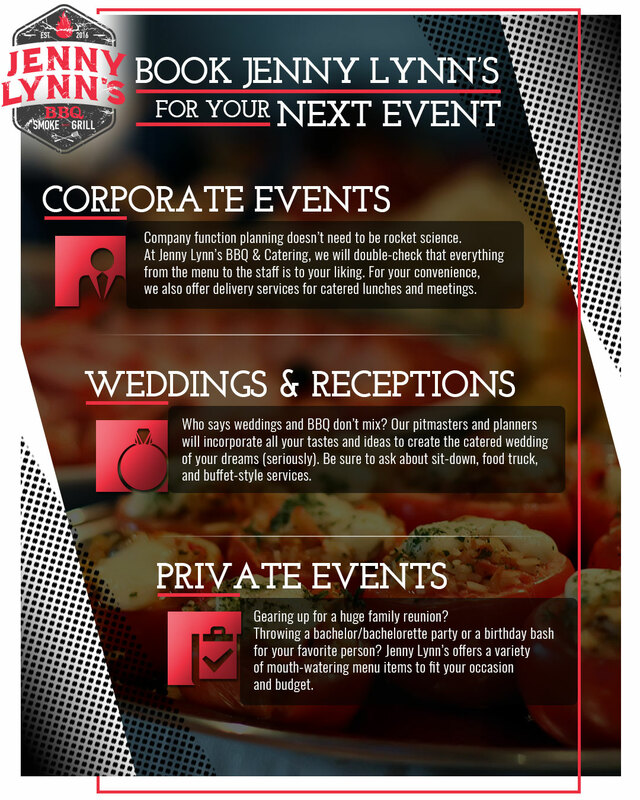 Instead, mix things up with Jenny Lynn’s BBQ & Catering.